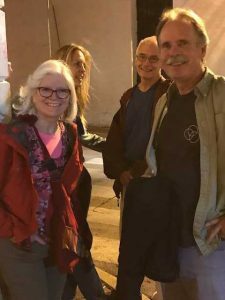 On Saturday, we met in the hotel lobby at 4:30am to start the journey back home. We were exhausted and bouncing between many emotions. We were missing our families and friends and excited to see them. At the same time we were very sad to say goodbye to the people from Food For The Hungry. We couldn’t be more impressed with FH and their mission and approach. 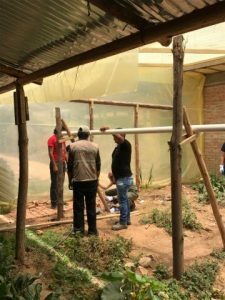 I had a rudimentary understanding of their mission and approach before we arrived in Bolivia, but I leave extremely impressed. They are extremely organized and deliberate in their approach. In this sense they are like a machine. But I think we were most impressed with the staff and how they serve. After all, a great plan and approach is nothing without people that have a heart to serve people with love. 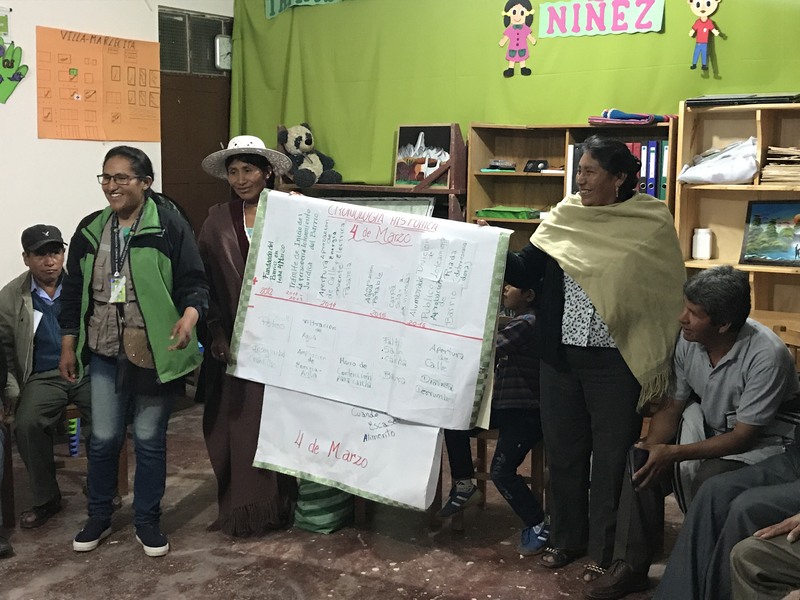 How community members and leaders, unprompted, spoke of FH and how integral they are to their community. How we would run across kids by the side of the road that would run and throw their arms around an FH staff member and hug them with everything they had. 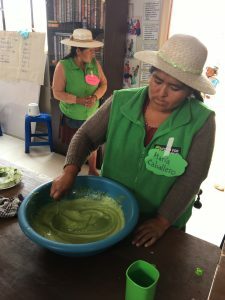 How the mothers we met with in the nutrition centers would pull a FH member aside and ask for guidance on some issue they were facing. 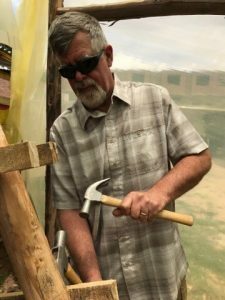 How the staff was so humble…there are amazing stories of extraordinary things that the staff was doing that wasn’t part of any job description but yet hit the bulls eye of holding their plans loosely and loving people the way Jesus modeled. 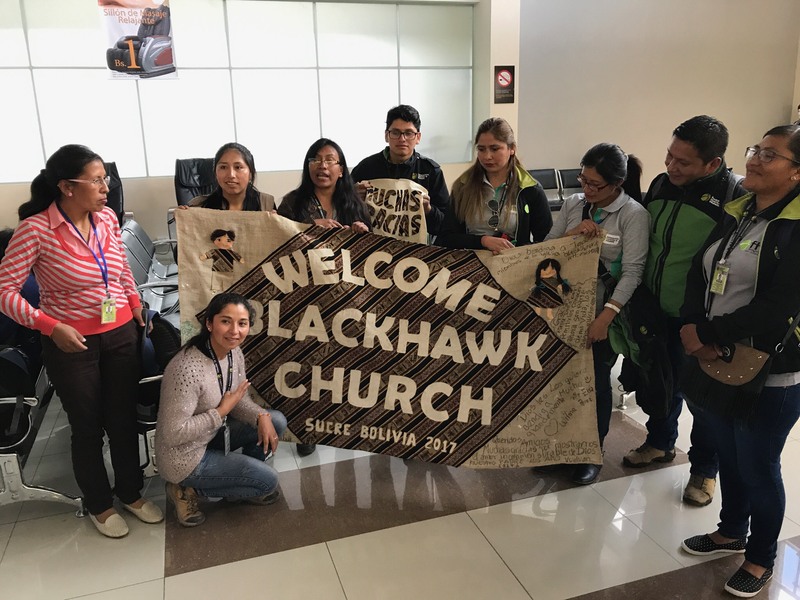 I now fully understand why Blackhawk partnered with FH in Bolivia. They match our ethos, have a great plan, a methodical approach, and have awesome staff. 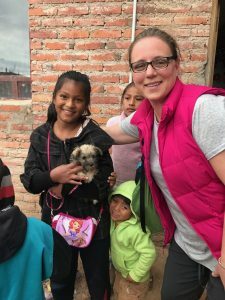 A big focus of these trips is to build relationships. In this instance we were able to build relationships with the staff. Each FH staff member has relationships with 200 families. We had the opportunity to build relationships with these people and mutually share and grow together. One of the most emotional moments is when the staff thanked us for helping and recharging their batteries. They are thanking us? They are telling us that we recharged their batteries? Are you kidding me? We got to see the hands of feet of Jesus in action a very real way, in conditions and with obstacles that can and would overwhelm anyone. The most common question I expect I will get in the coming weeks is “So what did you guys do?”. If I sense the person wants the short answer I will say we worked alongside an amazing organization called FH that is attacking poverty in a variety of ways and I will share some things that we did with them. If I sense the person wants and will understand more, I might say we built relationships with staff who each impact 200 families. If I sense that they want more, I will tell them I saw two teams encouraging and helping each other in a way that would please Christ. 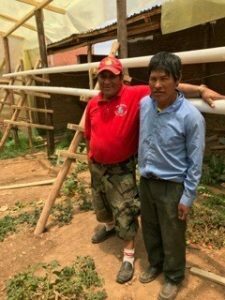 If you have been moved at all by hearing about FH this week, we encourage you to sponsor a child. This is FH’s primary source of funding and allows the amazing staff to call continue the incredible work they are doing. If you are interested in sponsoring a child through Food for the Hungry, email Maddie Blanchard at mblanchard@blackhawkchurch.org. If you want to sponsor a child of a specific gender, be sure to include that in the email. Maddie will get in touch with you about next steps. 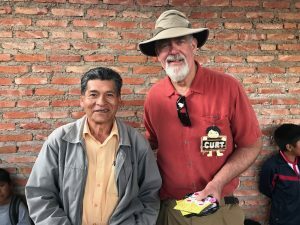 Want to hear more stories about our time in Bolivia? Consider attending our Show & Tell on Sunday, December 10th at 10:30am! We’ll be meeting in room 205B at Brader Way and would love to see you there! On Friday morning, it was time to pack up and say farewell to Sucre—our home for this past week. 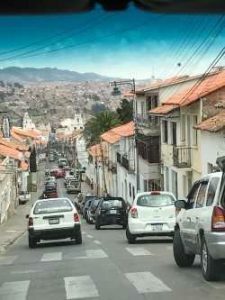 We left our hotel at about 9:30am for the drive to the Sucre airport and our 11:30am flight to La Paz. 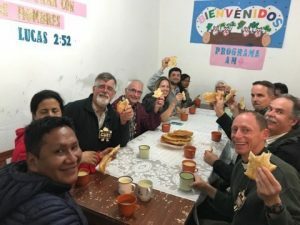 When we arrived at the Sucre airport, we were greeted by about 6 Food for the Hungry (FH) staff who had come to see us off, complete with a farewell banner! 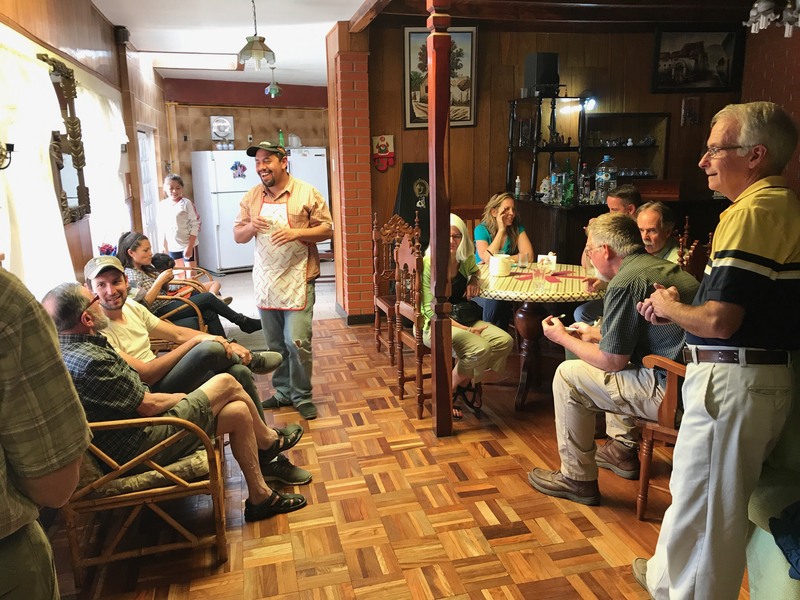 The FH staff and all the Bolivians we’ve met take hospitality to a whole new level! 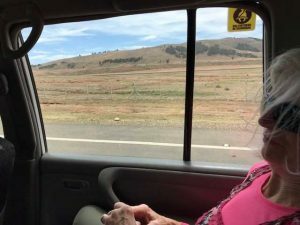 After the one-hour flight to La Paz, we boarded a bus and drove a short distance to a scenic overlook where the driver pulled over and we all piled out of the bus and hiked up to a viewing area. The view of La Paz from there was breathtaking (quite literally because the elevation was around 13,000 feet). 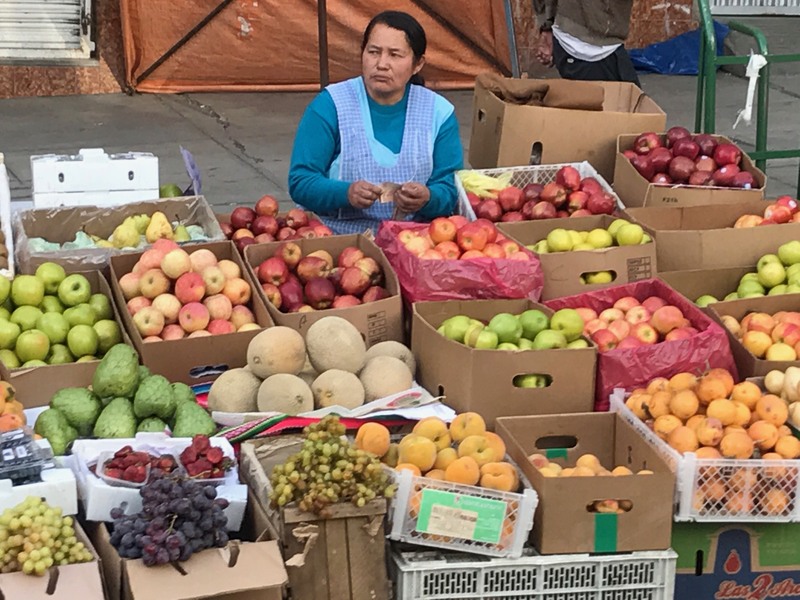 La Paz is a vast, sprawling city with snow-capped mountains as a backdrop. 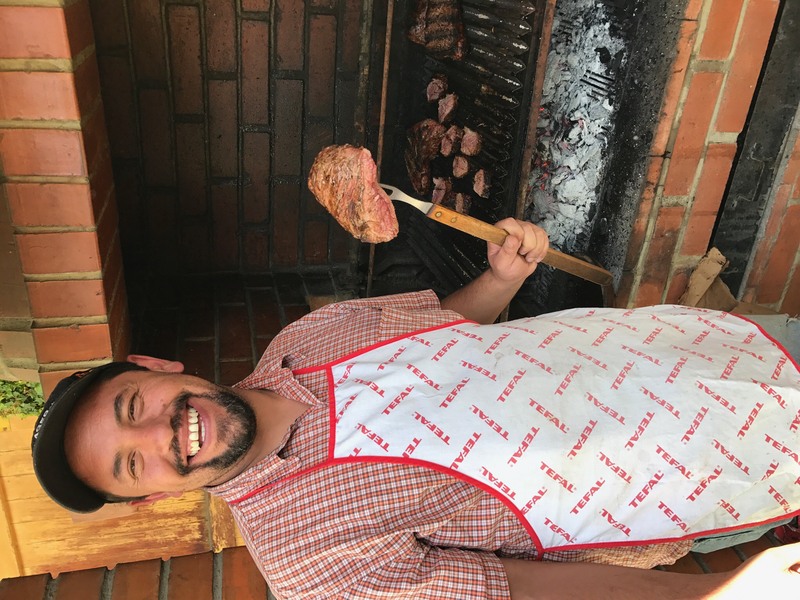 We wound our way through La Paz traffic and made our way to a luncheon put on for us by Juan Pablo (an FH staffer) at his parents’ house. 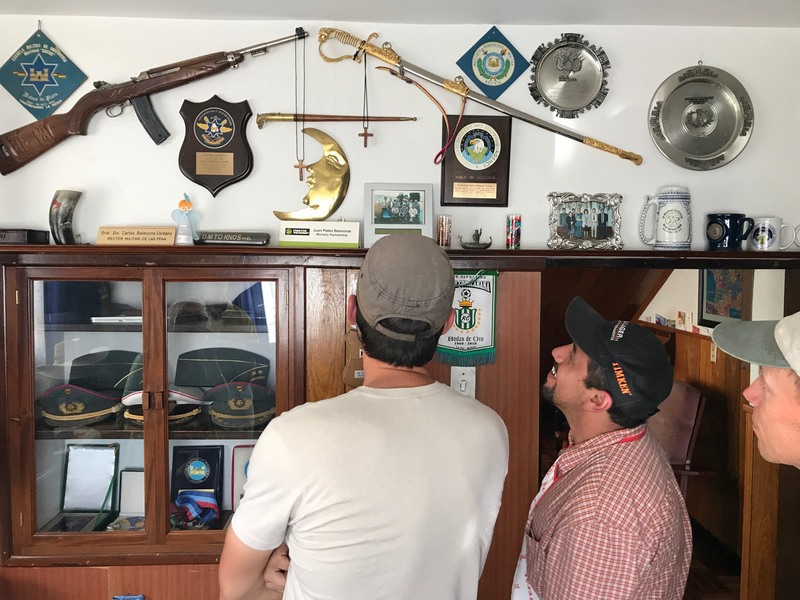 Juan Pablo’s father is retired, but he was once a high-ranking military official and his beautiful home is filled with a lifetime’s worth of military memorabilia. 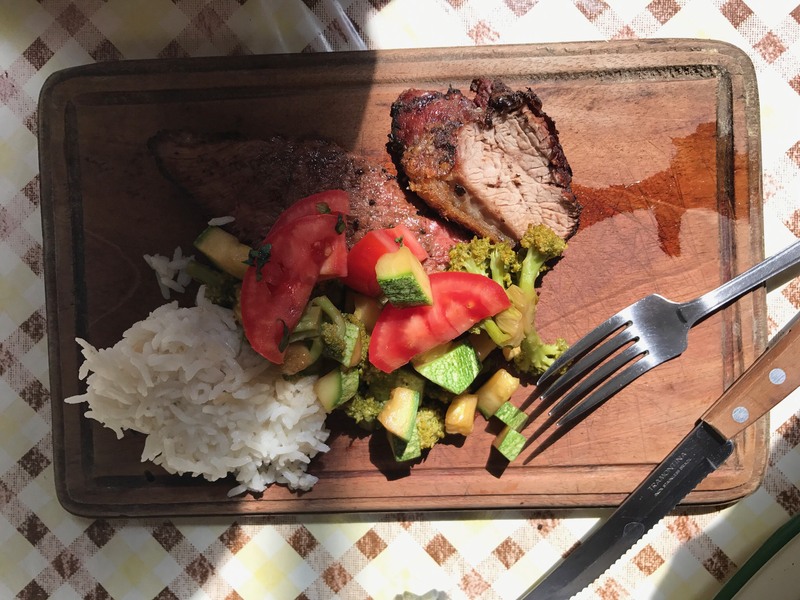 The family fed us well (extremely well) and showed us remarkable warmth and hospitality. 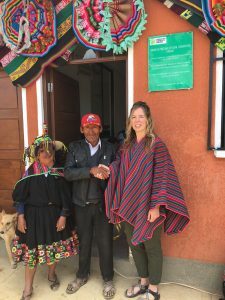 Over-the-top hospitality appears to be a hallmark of Bolivian culture. After the luncheon, we boarded our bus and went to downtown La Paz for some souvenir-shopping. 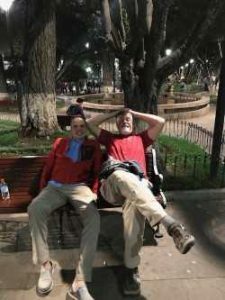 After we exhausted our supply of Bolivianos (local currency) it was back to the hotel for an early night in preparation for a 3:30am wake-up call to start the last leg of our trip home. 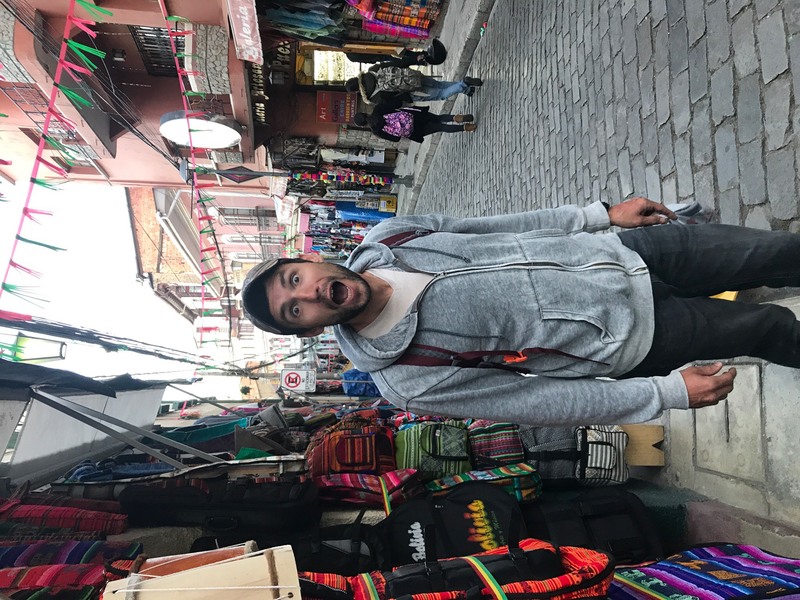 Saying goodbye to Bolivia and FH staff has been bittersweet. The relationships we’ve established here have gone deeper faster than any of us anticipated. So it’s hard to say goodbye, and all our farewell ceremonies have been emotional. 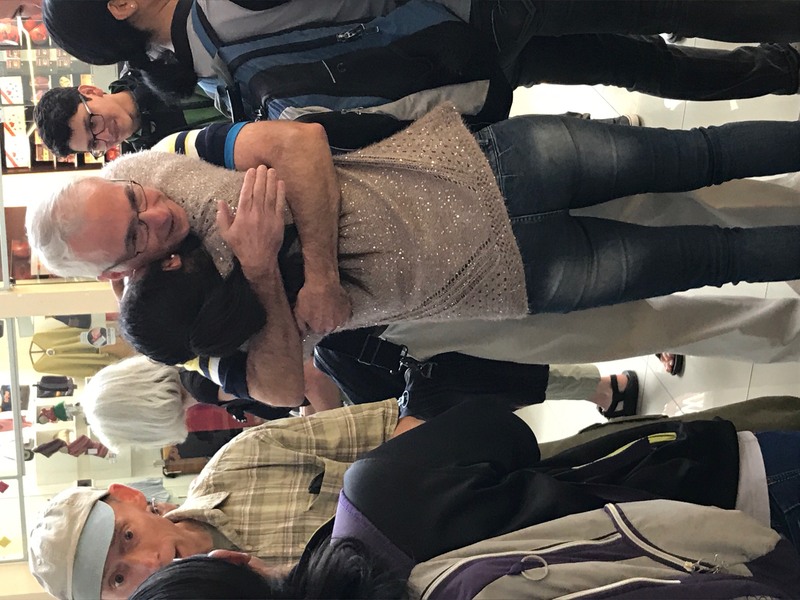 But we look forward to seeing family and friends back home, and sharing stories of God’s tender mercies and remarkable provision for each of us. Today was the first day that we did not need to leave by 7:45 a.m. so it afforded us a bit more sleep and time to debrief as we were all exhausted from a full day yesterday and walleyball ‘till 9 pm! 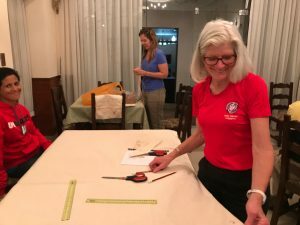 After finishing up cutting the PCV pipes used to support the fabric organizers, our team split into two groups. 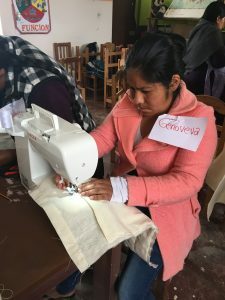 One group headed to a community center in one neighborhood of Lajastambo where over 20 women learned how to sew on new Singer sewing machines. 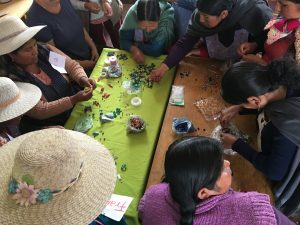 We sewed hanging organizers and made earrings and bracelets with beads. 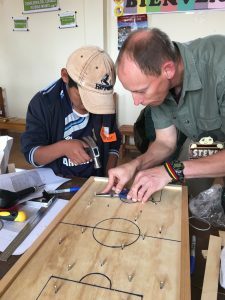 A second group drove to another neighboring community center to work with 30 middle schoolers to build wooden soccer game boards. Both teams reported great success in building relationships and creating something they never made before! 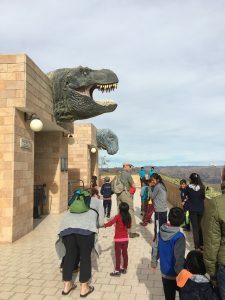 After lunch, we met up with about 15 children (three were our team’s sponsored children) at the Cretaceous Park to play on the dinosaur structures and tour the park that contained life-size replicas of dinosaurs. This park came about after many different footprints were discovered on the valley “walls” by a mining company and assisted by erosion of the tectonic plates that had heaved the valley walls upward. It was most interesting! In anticipation of leaving tomorrow, we had a farewell dinner with FH staff. 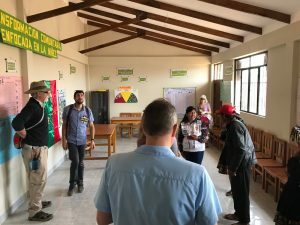 I think I can safely say for the whole team that we are thoroughly impressed with the servant’s hearts FH staff possess for the people of Lajastambo, especially the children, and for each of us as their partners. 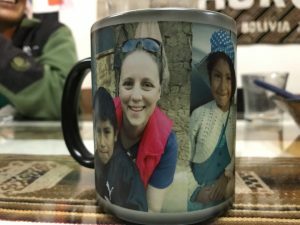 They gave us each an individually named gift bag with coffee mugs, which—when hot tea is poured into them—illuminated pictures of each of us with one or more Bolivian children! Though it has been raining a little bit on some days, it’s not putting a dent in the need for fresh water in Lajastambo. 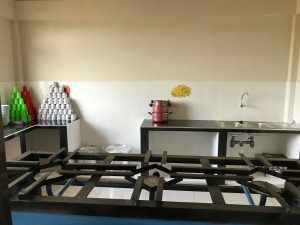 They get water delivered to their houses only twice a week😔 But the people are clean, and when visiting, are willing to share their precious commodity by offering guests a cup of water. I forget how blessed I am with fresh clean water available anytime with the turn of a knob! Please pray for fresh water for these communities! Looking forward to sharing more when we get home! First let me start by introducing myself since I didn’t do so prior to the trip. My name is Susan and I’m the Impact Director. 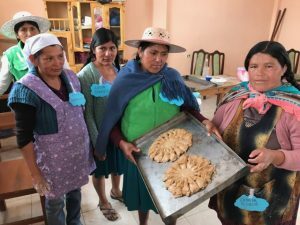 Last year we launched a new holistic partnership with Food for the Hungry in Bolivia. 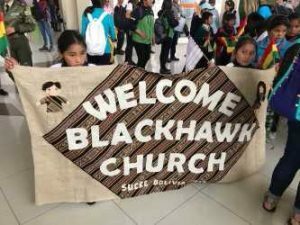 This partnership has multiple levels: adult GO Teams coming alongside the goals of our partner here, relationships between Blackhawks children’s ministry and children’s Sunday school/groups here in Bolivia, and over 200 Blackhawkers signed up to be child sponsors. 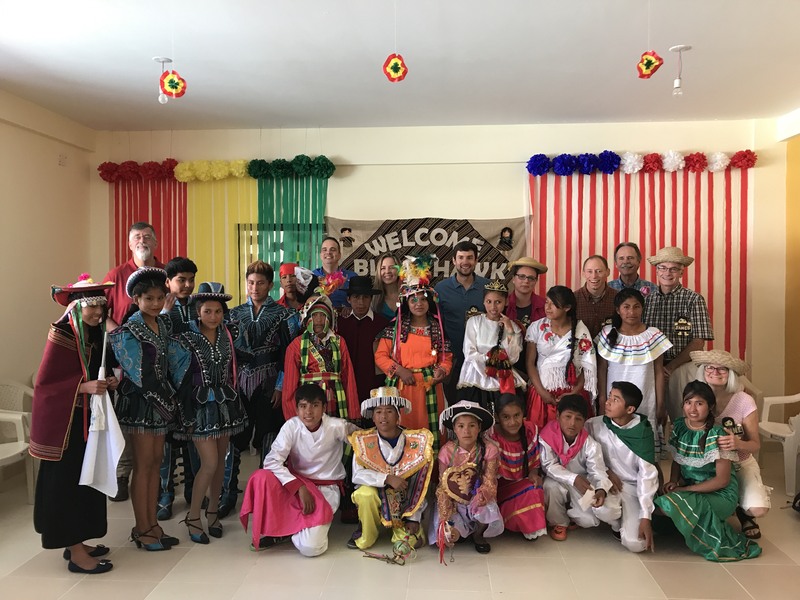 This trip was strategically planned after our Bolivia vision trip last year and the launch of our new FH Bolivia partnership. We are investing in this partnership for a 10 year run. Now for the day. Juan Carlos gave the devotions this morning at the FH office. He spoke of the greatest sacrificial servant -Jesus and that there’s no other way to provide service that God calls us to without knowing Him and having a relationship with Him of which the correctly motivated service to others flows. That was a very recalibrating and great start to the day. From there we headed to (location) to the inauguration of the new nutrition center. What a celebration it was! 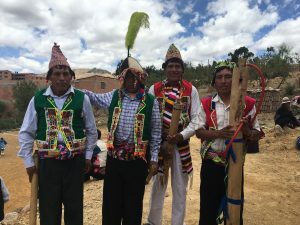 We were greeted by community members clothed in beautiful regional garments who grabbed our hands and pulled us into their cultural celebration. I think there is video of the Wisconsinites trying to find the beat, keep up and not trip over our own feet. The hospitality, beauty of the people, the land and the purpose behind our presence, was stunning. 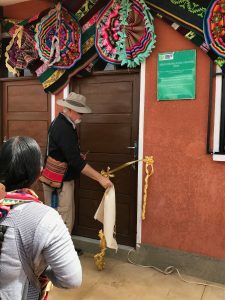 This very nutrition center was funded through part of Advent Conspiracy last year, 2016 and there we were today in front of it, blessing its new existence in this community and grateful to God for last years Advent Conspiracy that was focused on empowering hope. We were very honored to be part of the dedication service. We climbed up a hill to a beautiful spot where 25 families live and were able to be a part of a water tank dedication. 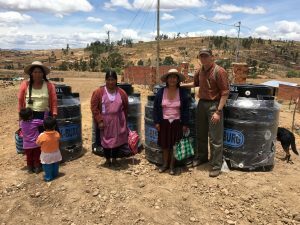 These water tanks will help families have safe preservation of water. 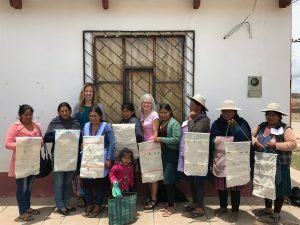 After lunch we split in two groups and after picking up some cafe con lache we headed to different communities to visit women’s savings groups. 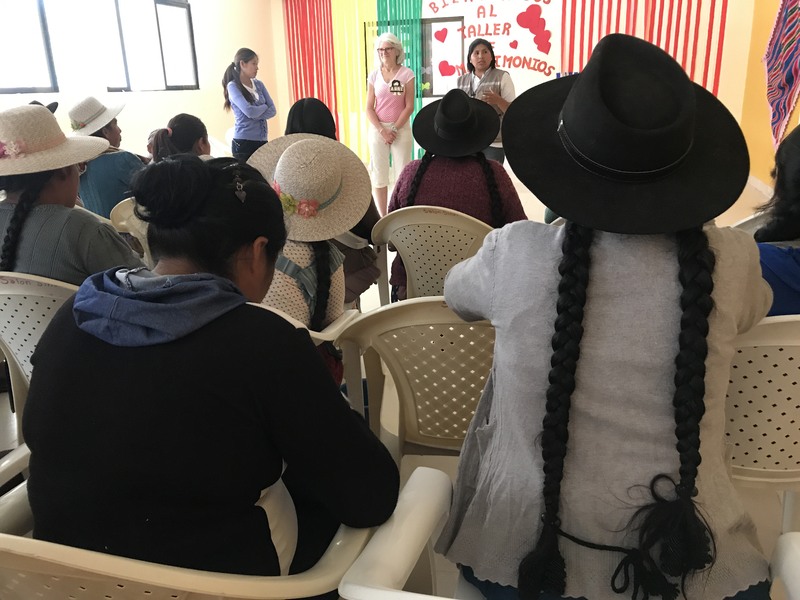 We met with multiple groups of women and learned about their process and goals. We were so inspired! Steve gave some comments and shared that he’s never seen a savings group as inspiring. He then shared that in the U.S. we have a saying that seems very appropriate…”Girl Power”! Sara and I were so moved by these women. Their strength and perseverance humbled us. 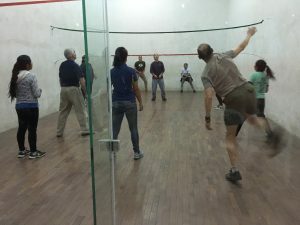 Walleyball with FH staff was the night activity. Apparently it is not only love, a smile, a laugh, that translate across cultures but also walleyball! Finally, if the day wasn’t amazing enough, outside of the wolleyball court Anne lead someone across the line of faith tonight. Please pray for the woman who made this decision, for her journey, for her discipleship. Please keep praying! Thanks for your part in this! Hello to my Impact team and kisses to my husband Marty and my mom. Love you both! We started out the day with beautiful sunny skies and a trip to the FH office for a short presentation. 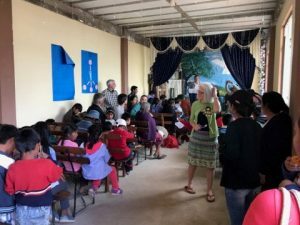 Afterwards we headed to Nueve de Marzo, a school on the outskirts of town which educates approximately 500 children ages K-12. 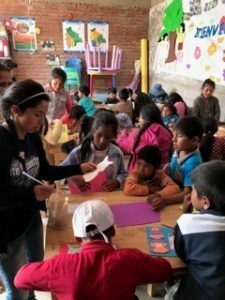 We had the opportunity to work with a classroom of 6/7 year old children to teach English (they also taught us some Spanish!). We worked on the names for various animals and made sure to throw in each animal’s sound as well – think Lion “Roarrrrr”. While at Nueve de Marzo we also juried an art contest for teenage students. 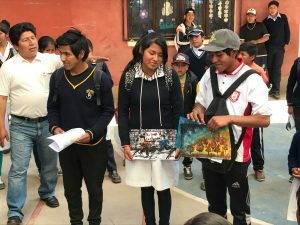 The students participating in the contest were finalists from previous contests and represented several different schools. Students were to base their art around the idea of environment. We were to judge their work using four criteria: creativity/originality, technique, message, presentation. It was a challenging task given how good all of their work was! In the end, the top three students from each group (we had to split them into three groups) received a backpack. After lunch we headed to Rio Jordan Church to make music with a group of children. We used musical instruments called BoomWhackers which are essentially plastic tubes of differing lengths, each length producing a specific note. Using sheet music with color coded notes (each BoomWhacker tube has its own color) we worked in teams of three (one adult and two children) to play Happy Birthday and Mary Had a Little Lamb. Each team of three was responsible for a specific note in the song. It was a very enjoyable experience with many, many laughs. After BoomWhackers we participated in a clinic on hand washing. 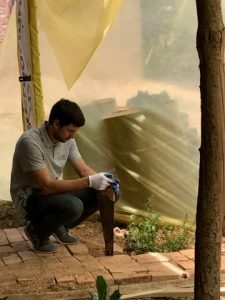 We were fortunate to have a pediatric surgeon on our team who demonstrated how to thoroughly wash one’s hands. 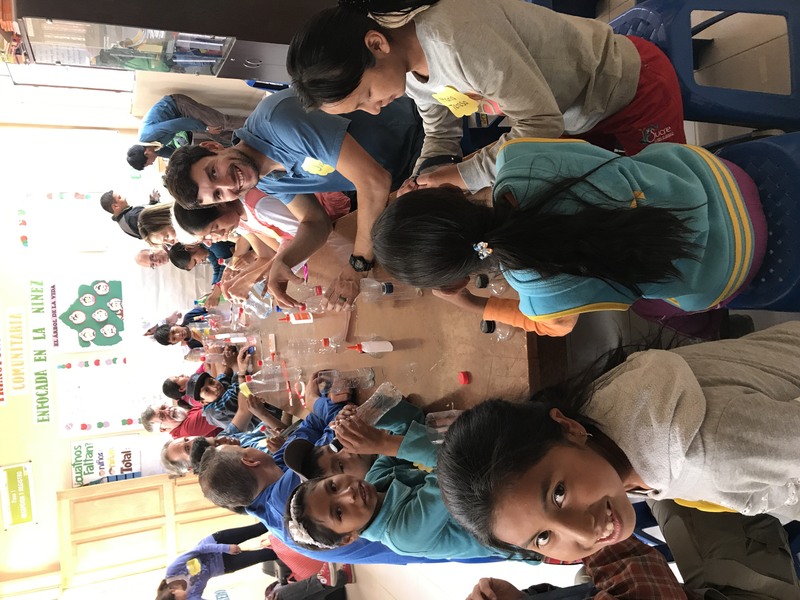 Once all of the kids had a chance to try washing their hands using this new method we broke into smaller groups and went out into the community to show a few of the local residents what the children learned. It was a fun experience and well received by the community. Steve and Anne R had a sweet home visit with their sponsor child Elizabeth and got to meet her mother and siblings. Elizabeth’s father is a pastor and was working construction at the time. 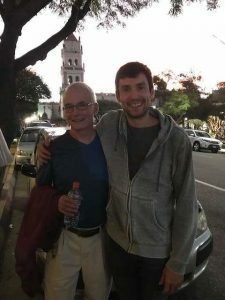 They shared gifts, and meal, and countless hugs. Elizabeth, who is 7 years old, was so appreciative of the coloring books and pencils. 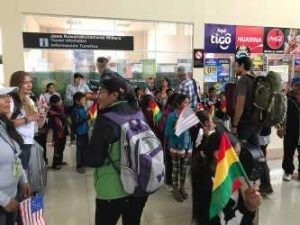 Steve and Anne now have a second family in Bolivia! That God would bless the people with access to safe water. This is the most common request we hear. That the people of her area would have an encounter with the Lord and the begin to fear and love the Lord in way that would transform their families. 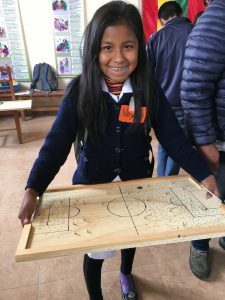 That there would be a transformation in the hearts of the teachers that are selfish and are working for themselves and for jobs that would not require the parents to travel so far. To open hearts to Christ so they can have a bigger vision-one that doesn’t just conform or settle but a vision that is more than they can imagine on their own. For families to be open to the gospel-for leaders to see wholistic needs and that families would understand that life is sacred. For transformation of leadership so they would have compassion for the most vulnerable and that all of their work would be directed to the children. That the children would know the love of God and become good parents. For a 7 year old girl named Mary. She lost her vision in one eye and is her losing her vision in the other eye. She needs a treatment or injection. Lastly when we asked how we could pray for the staffs individual or personal needs some one spoke up and said…we want you to pray for the people in the communities in the way we described and as for the staff just pray for the strength to keep doing the work, for encouragement when discouraged, to find meaning in what we are doing and for our families to understand the work we do. Sunday night we attended Iglesia Emmanuel and were warmly welcomed with traditional hugs and kisses and hand shaking. With the help of Jon who did a super job leading us in worship (I’m so glad he came, thanks Rachael and girls for letting him go) we sang some favorite hymns. Carl was able to share with the church his struggle and triumphs in his walk with Christ. Monday has been a busy day!! 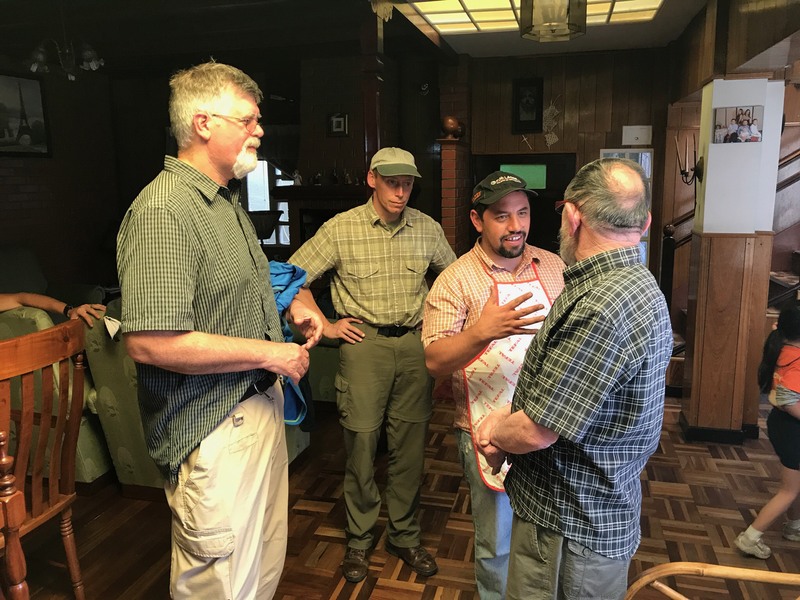 We started with a meeting with the FH staff, a group of dedicated workers who have divided the city and surrounding areas of Sucre to reach out with the Gospel and an organized effort to eradicate poverty and hunger. Blackhawk is helping with the largest area called Lajastambo. 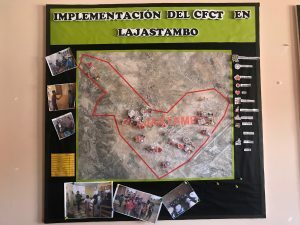 German (pronounced Hairmon) the leader of FH in Sucre gave us an extended explanation of these efforts. Our Sara gave a very encouraging talk on working with relationships in ministry. We asked the staff to share with us prayer requests and we were impressed by the difficult struggles they are dealing with. Our next post will have Carl’s summary of those prayer requests. After that meeting we had a great time with about 30 Mother Leaders. 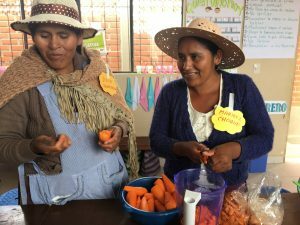 These are moms who are learning about preparing and cooking nutritious food for their families. 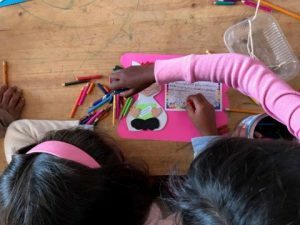 They are sharing these skills with other mom’s in their neighborhoods. 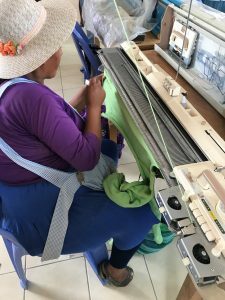 We were impressed to learn that most of those women lead groups of 20-40 women each! 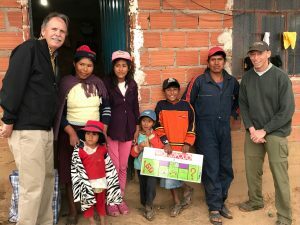 In the afternoon several team members made home visits to sponsored children (see Steve B’s comment about that below) while the others hunted for project supplies in the markets of Sucre. Please pray for physical health as some minor illnesses among our team members are occurring. 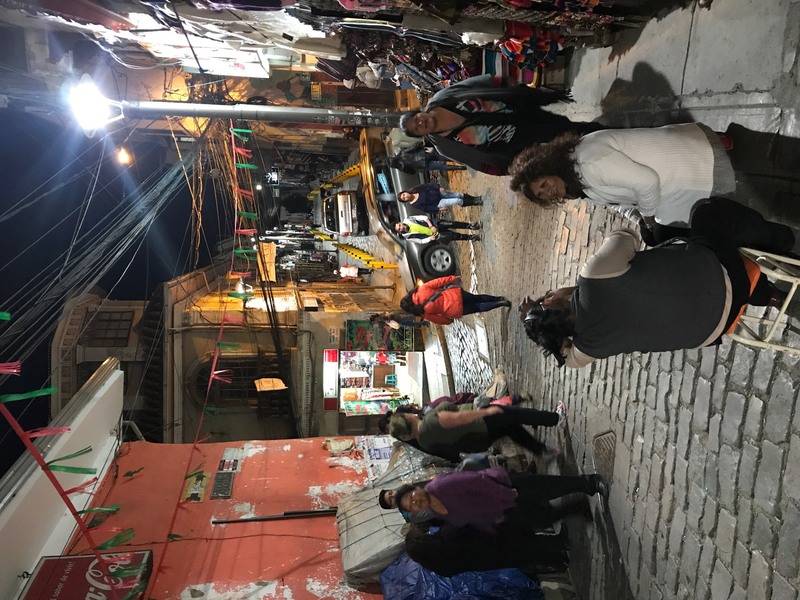 Tonight we were able to meet up with a former Blackhawk Downtown attender, Megan B, who is working in Sucre with the organization called Pioneers for several months. 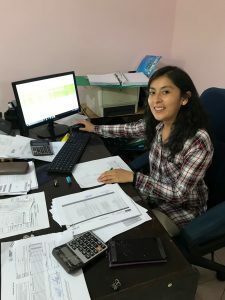 She was very encouraged by her time with us! 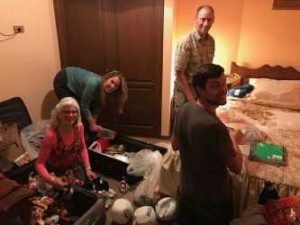 This afternoon a portion of the group (Steve B, Steve R, Anne R and Sara Z) went out to make home visits with our FH sponsored children. 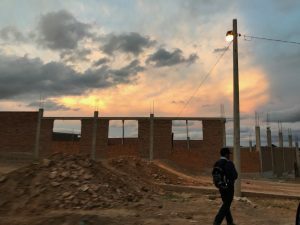 We traveled on side roads that wound through some Bolivian Barrios. This was truly a special experience filled with huge smiles, big hugs, and prayers for each child and family. 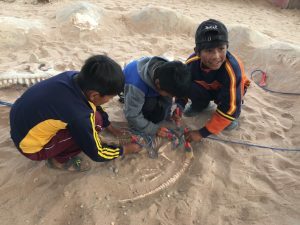 The amazing assistance of FH field staff continued with their amazing insights into each of these kid’s lives. The first visit included a visit to Steve B and family’s child who happened to have her birthday on this exact day (coincidence…probably not). She was dancing with joy as she received a birthday cake, gifts for her and also gifts from FH for her family. We all sang happy birthday in 2 languages and then we were requested by the child to sing some more. The visit continued with the child, her sister and neighbor girl singing Psalm 23, her brother showing off his acrobatic skills and a hug that brought tears to some member eyes. From there we traveled to two different homes of children sponsored by Sara Z and family. Sara shared family pictures, exchanged gifts and had heartfelt conversations with her “kids” and their families. 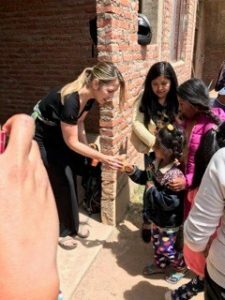 In each case the children were attached to her as they showed off their heartfelt appreciation that their sponsor came from so far away to see them. 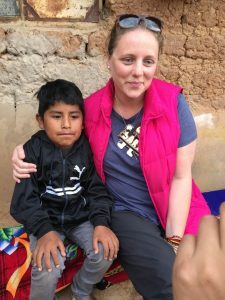 In each case Sara Z prayed for the complex and difficult situations that each child and their families were experiencing. We ended the tour with a visit to Tom S’s sponsored child. Steve B. and Steve R. filled in for Tom and presented the child with gifts, received hugs and were offered sacrificial return gifts of bread and eggs. Steve B was even able to treat an abscessed tooth for the child’s mother. We drove home as dusk approached sorting out all the different emotions of having to leave and were greeted by an amazing Bolivian sunset. 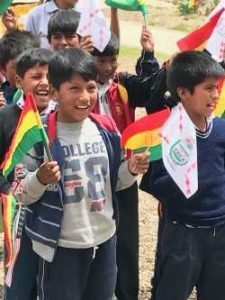 It really provides motivation to sponsor a whole bunch more of God’s children in Bolivia who have so much potential if given the right support. – Steve B. The morning started off cloudy and cool but it has turned out to be another beautiful day. We had breakfast at the hotel and then we were off to church. We went to church this morning at Rio Jordan church in Lajastambo. 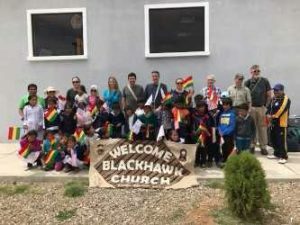 We received a very warm welcome from the pastor and the congregation. The wanted us to say hi to everyone back home at Blackhawk and to tell you that they have been praying for us and you, and they send their blessings. They have prayed that we would come back and they knew that it would happen. They had a map from the initial planning team trip hanging on the wall. They greeted us and then we sang several songs in Spanish. After that it was our turn to sing a few songs in English for them. Jon is an excellent guitar player and he blended right in with their worship team and then lead our group. Fortunately a few of us can actually sing and it went well. They seemed to enjoy the songs in English as much as we enjoyed the ones in Spanish. Next, the children left for Sunday school and Sarah, Susan, Steve and Steve went to help out with the lesson. The rest of us stayed for the sermon. They had asked in advance for one of us to give the sermon and this is a common tradition. I gave the sermon this morning and the topic was on children and God’s instruction on how we should raise and treat our children. I am lucky that there is a lot information on that topic in the bible. When the sermon has to be translated into 2 other languages it takes a little more time. It seemed to work out well and the church pastor made us all memorize one of the verses in the sermon at the end. After that the children returned from Sunday school and sang us a song of appreciation. When the service was over, everyone in the congregation formed a line and thanked each of us for coming. After church, we all worked on a project at the church where they are building a hydroponic garden. We worked with members of the congregation and FH staff and we did make some progress. They will work on it again next week and they are close to having it finished. They said that they would send us pictures of the plants when they are growing. The pastor noted that the church also wants to be able to teach the community skills that will be helpful in their everyday lives. They sent us off with some food and a song. We had lunch with the FH staff and are back at the hotel for a short rest and then we will be on the road again. The day is young and we have more to do. Thank you for your prayers and we will see you soon. 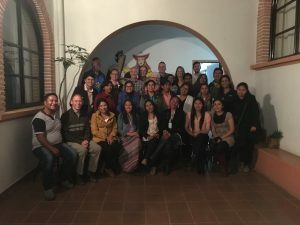 Today was the group’s first full day in Bolivia- special memories mixed with amazing hospitality! 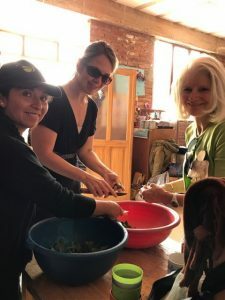 Throughout the day we were privileged to work alongside our host, Food for the Hungry (FH), and appreciate the thoughtful and well orchestrated way that they connect with their partners (i.e. us) and their communities. Their caring nature was ever present. We also sensed the genuine way that the people of Lajastambo wanted to get to know our Blackhawk group, and share their lives and dreams. Their friendliness and joy was heartwarming. We experienced the love of brothers and sisters in Christ no matter how different our cultures might seem. 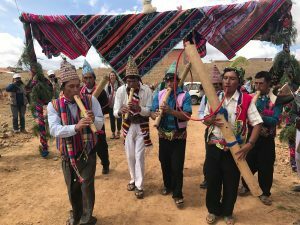 Our day began with welcomes and then the pageantry of the children, teenagers and adults demonstrating the cultural and historic dances of different regions of Bolivia. The artistry of their well chosen steps and the intricacy of their costumes could not have occurred without hours of preparation. It cannot be truly captured in pictures or video. 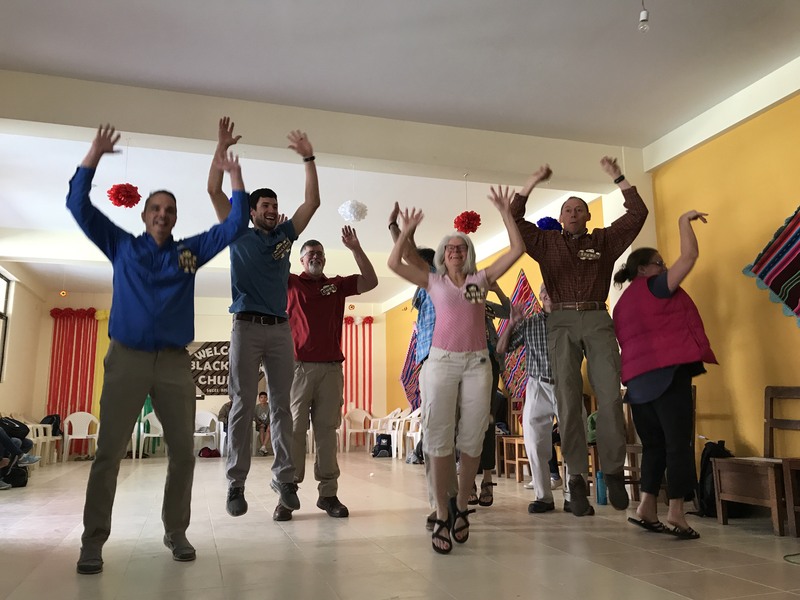 We then somewhat spontaneously shared the quintessential Madison dance, Jump Around, thanks to the creativity of Carl and graced by the entire Madison team and the music and lyrics of Youtube. 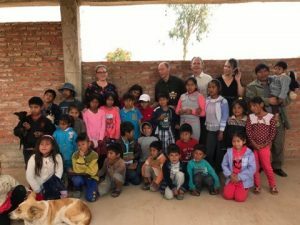 Some of our Bolivian partners and the kids even joined us with smiles shared by all. The morning progressed with opportunities for us to get to know individuals at that FH site. 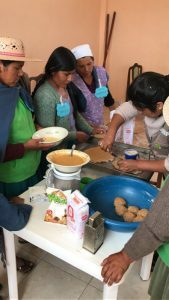 In the early afternoon we met at a Nutrition center and spent time with some of the kids that are mentored weekly by FH staff. 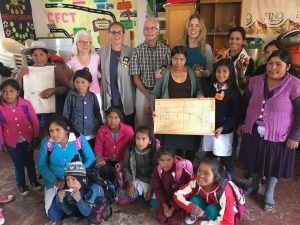 This included games, crafts and a time to gift some of the many school supplies collected by our Blackhawk church family. We didn’t expect to be bedazzling empty soda bottles but it was worth it to see the smiles of those kids. The day continued with home-made fresh fruit and yogurt cups that were an explosion of color and taste. 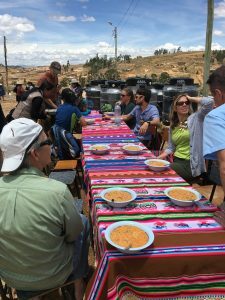 We then were provided a delicious and nutritious lunch by FH staff- can you say "delicious flax seed derived sweet beverage"? We then gathered at a community center and participated in a half-day couples workshop led by FH staff. 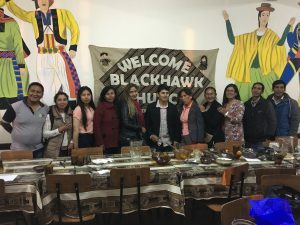 The attendance rivaled some of the successful conferences held at Blackhawk Church- we were also pleasantly surprised by the number of men in attendance. Steve R. shared a message with the men, and Anne R.
worked with the woman. 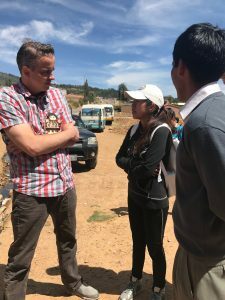 Their teaching was engaging and practical, resulting in active question and answer sessions, and several impromptu couples counseling sessions. The day ended with a meeting with the community leaders from a number of the surrounding neighborhoods. They shared their needs, their vision and transformational plan for how they could improved the lives of their children, pregnant mothers and citizens. This provided us with a strategic plan that was impressive (even for those of us that are less inspired by the strategic planning process). I ended the evening by sharing some words of encouragement and comments that pertained to the critical role for good nutrition in helping children realize their highest potential through healthy body and brain development. At days end, we were tired yet content and motivated to see what tomorrow will hold. God bless to family, friends and others who are supporting us. 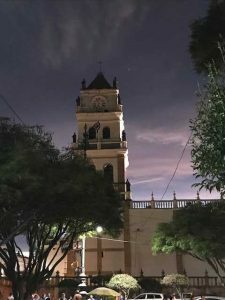 Dios le bendiga. 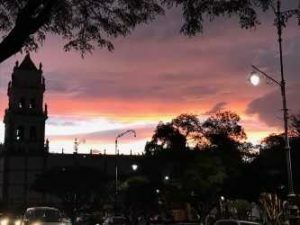 We left Madison at 9a yesterday, arrived in Chicago around noon, arrived in Miami around 730p, arrived in LaPaz around 5a, and arrived in Sucre around 11a. It has been a LONG two days of travel. 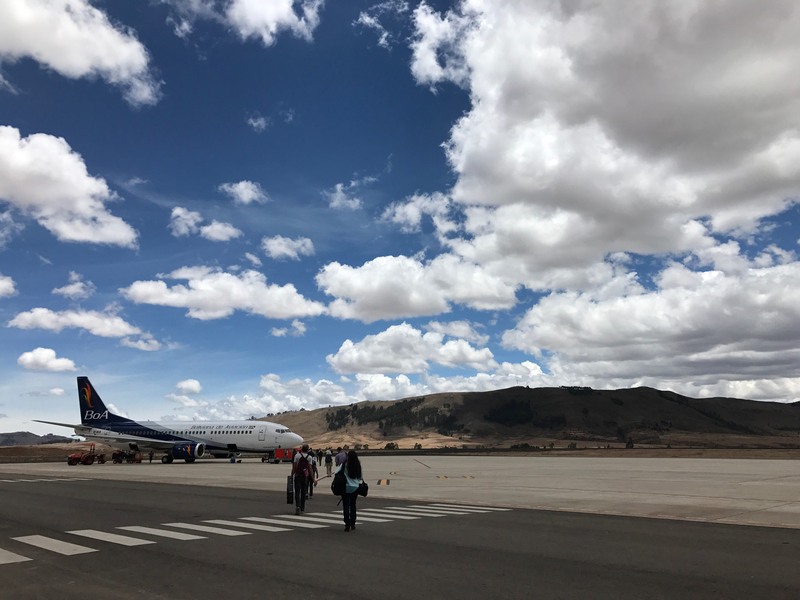 La Paz is at 12000 elevation so some of us struggled with lightheadedness and nausea during our few hours at the airport there. 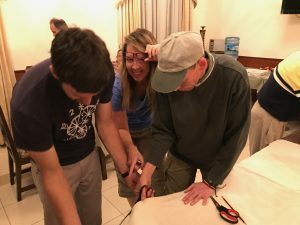 However, now that we are in Sucre (9000 feet), we are all doing much better. 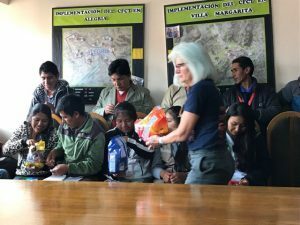 We arrived at the Sucre airport and were greeted by several Food for the Hungry staff that work in our partner community, Lajastambo, as well as a 4th grade class from the school. 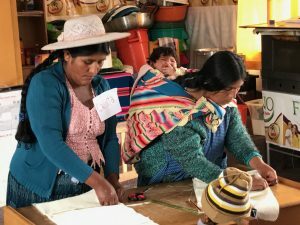 They sang the Bolivian national anthem and passed out some beautiful bags to our team. It was a sweet moment for the team, we were so warmly welcomed! 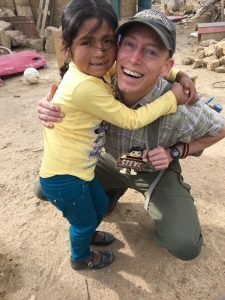 Steve and Anne immediately recognized their sponsored child and were able to spend some time with her. 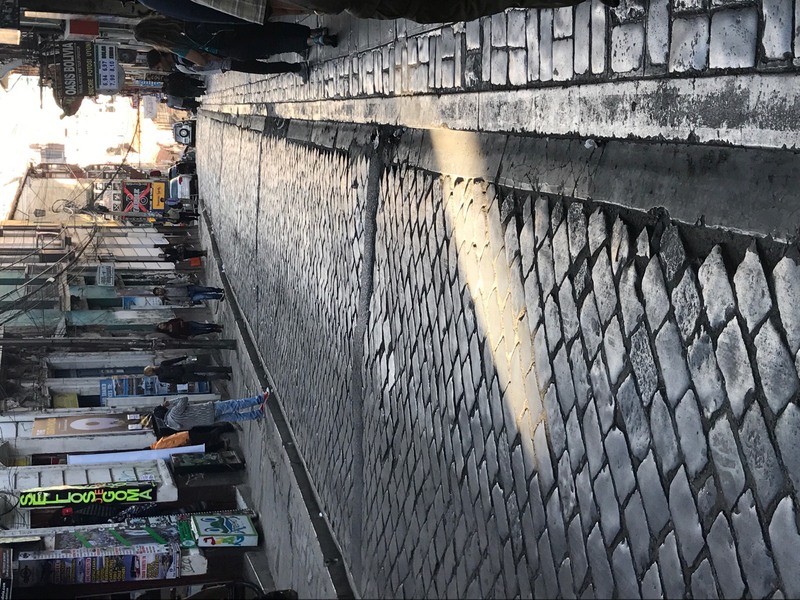 After that, we headed to our hostel and crashed for a few hours followed by a walk into downtown Sucre for dinner. We are all ready for a good nights sleep and have such anticipation, joy and excitement for the week ahead. 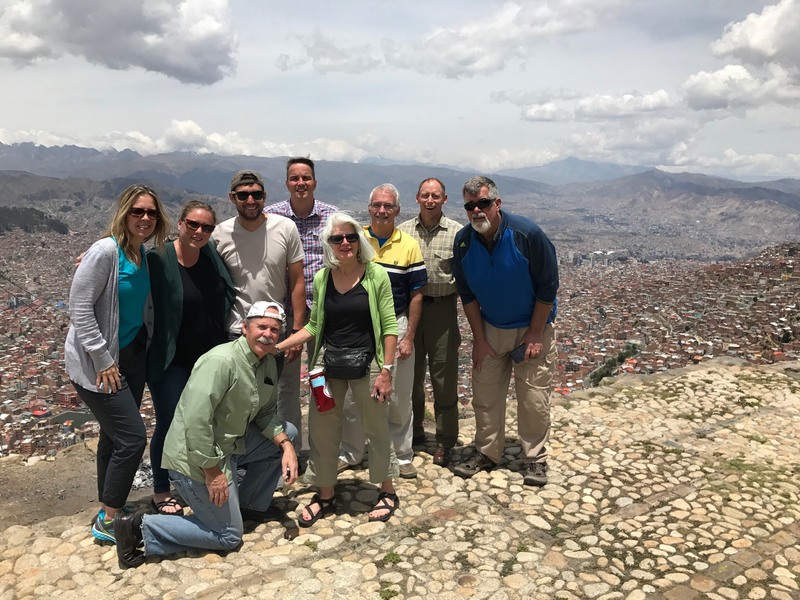 We have thoroughly enjoyed getting to know each other better while traveling and are really enjoying spending the week getting to know the families in Lajastambo as well as the FH staff. A special shout out to my family: Ben, Annika and Celia. I love you three like crazy. Thank you for making space for me to be a part of this team. Thank to each of you for following along! We covet your prayers this week.